My oldest son just turned four in January. 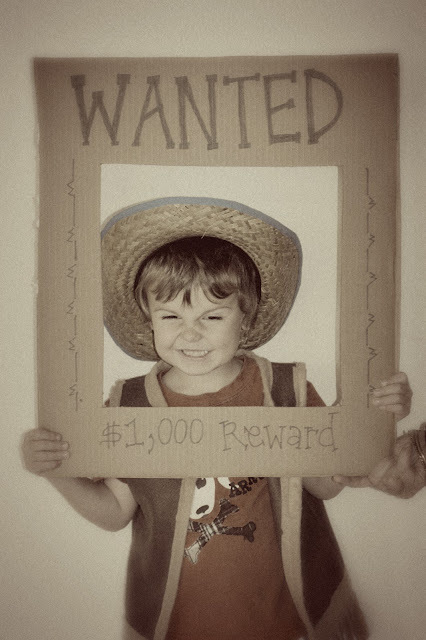 He loves everything to do with the Wild West. One of his favorite places in Los Angeles is the Autry Museum. I highly recommend it to anyone who is in the area--it has a lot of hands-on fun for kids as well as interesting exhibits for adults to enjoy. It is free to everyone the second Tuesday of every month (including free parking). For Christmas, I made my son this easy cowboy vest. He loves dressing up in it. I also made him pretend cowboy boots out of some cool patterned felt, but he decided he'd rather just wear his rain boots than wear fake felt cowboy boots. Then, for his birthday in January, we threw him a cowboy party. We kept the party somewhat small because he is only four years old. He invited two friends, along with their families.When the guests arrived, they each received a cowboy hat and bandana as a party favor. Then, I took a photo of each guest holding up a "Wanted" poster. I sent those photos to the guests with their thank-you cards. 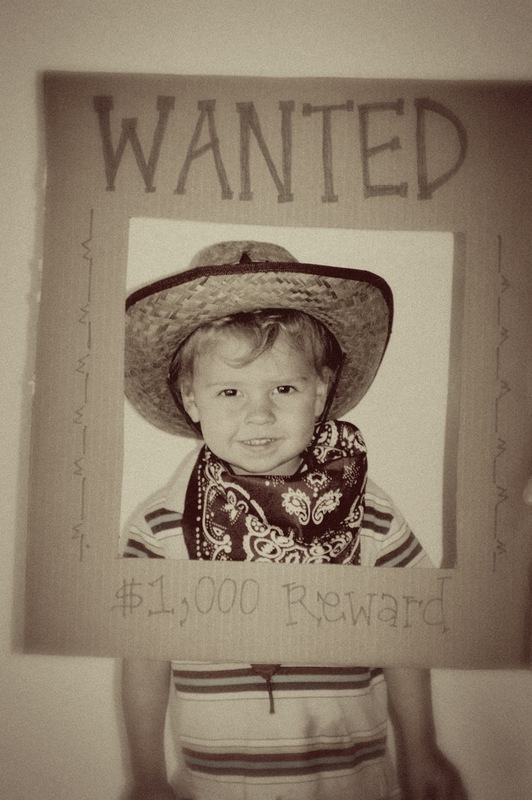 Next, guests went to the table where they decorated their own small "Wanted" posters, along with brown paper treat bags. I got the idea for that activity, as well as a link to a "Wanted" printout from this website. I was also inspired by the Western-themed party games from Family Fun. We played a "don't let the snake bite" game with a rope. Two adults wiggled the rope on the ground while the kids tried to jump over it without touching the rope. This game led to a lot of laughter and giggles from my energetic kids. Then, we also tried it jump-rope style for the older kids. We also tried to "lasso the horse," using a hula hoop to ring my daughter's play horse. Meanwhile, we had fun bouncing in the bounce house that my generous sister gave us for Christmas. My energetic kids love this bounce house. We play in it almost every day. If it's raining, we put it up in the garage or in our family room. On clear days, we put it in our backyard. It was a good size for the small party we had--though it wouldn't accommodate more than half a dozen kids if you had a bigger group. Next, we had a Western-themed lunch that included BBQ beef sandwiches, corn on the cob, cornbread, dutch oven potatoes, fruit, rootbeer, and lemonade. We then went outside to a hit a cowboy boot shaped pinata. Finally, we finished off with this cowboy boot cake--inspired by this one.